[SOLVED] Mine AROs Overlapping with Movement Declarations? Discussion in 'Rules' started by fenren, Oct 29, 2018. What happens at the conclusion of this order? 1 - A pair of active troopers declare movement as their first short skill, ending their movement next to a reactive trooper in camo maker state. 2 - The reactive player declares placing a mine as their ARO (in base2base with their trooper) revealing the reactive camo trooper. 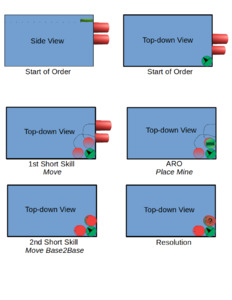 4 - The declared "Desired" path for the first and second short movement skills of the active player and the declared placement of the mine by the reactive player overlap. A) The mine is canceled on Conclusion of the order, because an enemy trooper is there. C) The enemy trooper moves and the mine is placed below them because, "In Infinity, Orders and AROs are simultaneous regardless of the Skills declared." D) None of the above... HELP! As a Mine never triggers if the Small Teardrop Template affects an ally, successfully placing a mine in this situation would mean the active troopers, assuming they win in close-combat, may be subject to the mine triggering later in the game on their next order or ARO declaration. I am not sure if it is covered, but it would make sense that the trooper could not move over the mine as it was declared first. Mines are placed at Declaration, Mine placement resolves at Conclusion. This means that there's a where the mine placement is known but the mine isn't technically on the table. The reason this timing exists is to prevent Mines triggering on the order they're placed. My understanding is that @mike's interpretation is an unintended consequence of that. Personally I prefer playing it that you can't move through a Marker thats on the table even if that Marker doesn't technically exist yet. There's another thread on this that someone should see if they can find. daboarder and DukeofEarl like this. Thanks for the feedback, we played it as the mine not being placed at the time. The ability to end movement where mine placement is noted during ARO declaration, thereby forcing cancellation on Conclusion of the order, nerfs mine AROs, but is still better than not having an answer. DukeofEarl and inane.imp like this. I don't get it. Which rule (FAQ/Wiki/PDF) is used in this situaion. I don't say, you are wrong, I only want to understand it. Movement that does not require a roll is executed immediately according to the general movement rules and you're not allowed to place game element inside other game elements. Nemo No Name likes this. Can you then always prevent your oponent from placing the mine when you occupy the place where he wants to place his mine or is it placed after the movement of the active trooper. That’s the thing. For as much as people keep saying “everything is simultaneous” for Infinity, a whole lot of it isn’t anymore and that simultaneity gets replaced by sequential declarations and a certain amount of retroactivity. For instance, active turn movement is declared and resolved, and then you have retroactive of shooting and actions along that movement path. Mines or Camouflage Markers are not considered deployed until the Conclusionof the Order. By spending a Short Skill or ARO, the user places a Camouflage Marker (CAMO) on the game table to represent the camouflaged Mine. In the Active Turn, the trooper can deploy the Camouflage Marker in base contact or, if he moved, in base contact with any part of his route. In the Reactive Turn, the trooper must deploy the Camouflage Marker in base contact. So when you declare the Mine ARO you place a camo marker on the table, and that camo marker isn’t considered deployed until the conclusion of the order. What does “deployed” mean? We know it means that the mine won’t activate the same order it’s declared, and can’t be shot or otherwise mineswept the same order. But is the camo marker there for the purposes of the old “You can’t move into base contact with a camo marker” rule? As far as I can tell, it is. Because that’s the simpler solution, the one that doesn’t cause any quantum snap backs or any of the other 2nd edition mess that N3 was trying to eliminate. The marker was placed on the table, future movement is now constrained to go around it. BLOODGOD, fenren, inane.imp and 1 other person like this. I think you and I are not on the same page. But let's roll with it. "Can you always prevent your opponent from placing a mine?" If you're close enough. Please refer to @inane.imp answer. "...when you occupy the place where he wants to place his mine..."
Well, you can't place the mine there at all, which is what I'm pointing out. So if you completely box in a Guilang at any point prior to them getting an ARO, the Guilang won't be able to declare AP Mine skill as ARO to place an AP Mine because there's no space to place the mine in. "...or is it placed after the movement of the active trooper"
As per the rules, the mine isn't actually placed until the end of the order. Please refer to @inane.imp answer. Please note that the same applies to Dodge ARO movement! You can use your second short skill to body-block Dodge movement if your opponent declares the Dodge to a place you'd rather not them move if you're close enough. "Is not considered active until the Conclusion of the Order" would have been neater - but I don't think body-blocking using mines is a very good interaction. As some players said, remember that the mine are no considered deployed until the Conclusion of the Order. In this case I see that you cant deploy the mine. DukeofEarl, inane.imp and daboarder like this. Is this also true then? Or, was Alice not allowed to move into the space where the marker is and the Mine will be placed at the Conclusion of the order? Edit: just changed the verbiage of the second option to make it clearer. Wait, are you saying if I move towards a model, they elect to ARO place a mine, then I declare a second move order overlapping the mine, I can effectively cancel the mine placement and waste a mine charge? I'm not sure how I feel about that. On the one hand it seems like a janky rules interaction, on the other hand a trooper is fumbling trying to lay explosives and someone runs up and kicks it out of his hands? Step 3. Alice fires an LFT at Bob. Ben Kenobi and Hecaton like this. I figure that Bob would just move the furthest distance he could then stop in this scenario which includes a possible 0", just like declaring movement in general. He can't specify an exact stopping point anyway because you can't pre-measure the dodge movement. Yeah. That's how I'd rule it as well: stop the putative 1mm short of B2B. But that's just making stuff up to make it work on the table. RAW there's an immovable object and irresistible force. "Movement resulting from Dodging in Reactive Turn can never be used to enter base to base contact with an enemy. Only the Common Skill Engageallows that." "A trooper's Movement ends automatically whenever he enters base to base contact with an enemy, even if the movement route specified is cut short as a result." Thus making a declaration that moves a Dodge into B2B is not covered by the rules and consequently must be invalid. Declarations that are invalid at resolution are resolved as Idles. I'd rule that as the dodge movement was declared before the regular movement in the order sequence, it has precedence over the regular movement, resulting in the active player being blocked. Which *seems* to be the opposite of what @HellLois is suggesting.